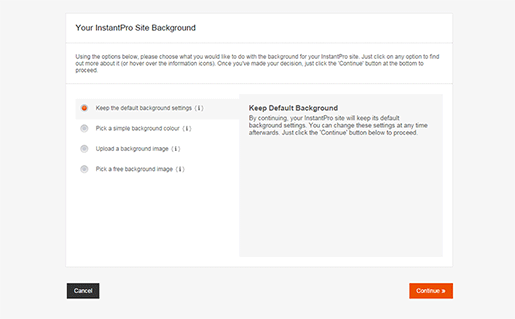 Important: When you first open the InstantPro Website Builder you will arrive at the Site Overview screen and you will need to click on Edit Theme Design under the Themes & Styling heading, as shown below. Having a good background colour or image for your web site can really affect the overall look of the site. Within the web design editor it is possible to set a background colour, or use an image which can be repeated across the page. You can even use a combination of both. 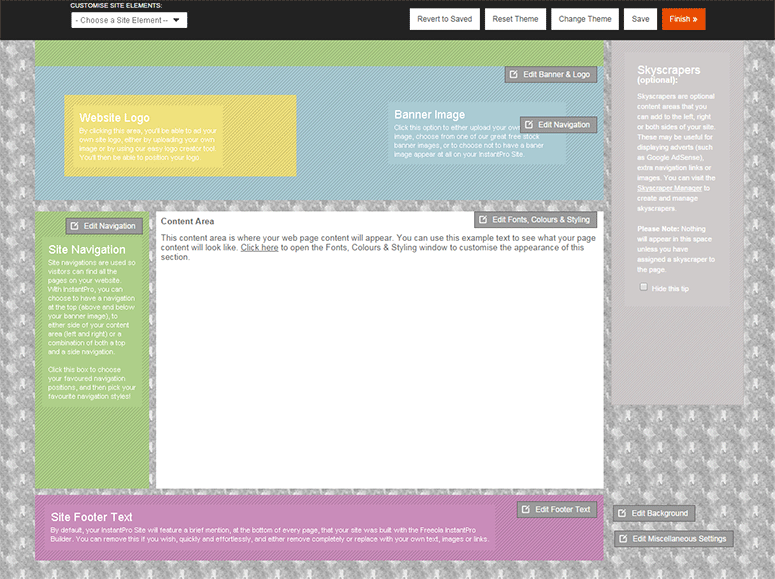 To set the site background you will need to click the correct area on the web site design editor page, which is shown below. Once you have selected this option you will be presented with a number of different options regarding the background. 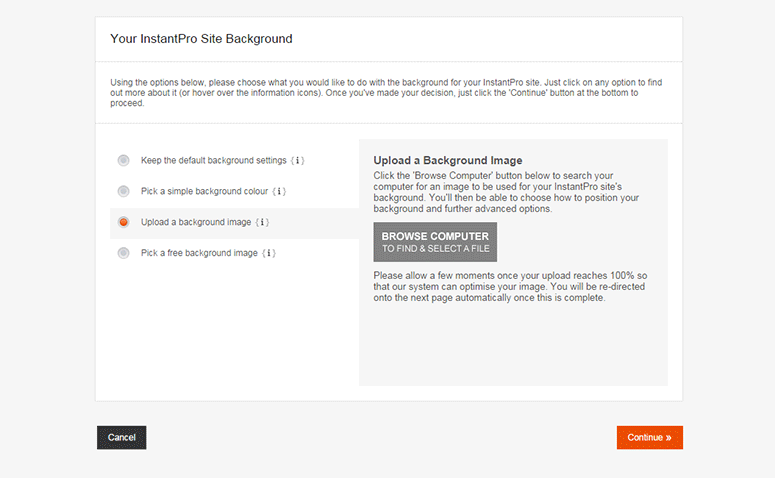 You will be able to keep the default background by selecting the option shown below and clicking Continue. You can also pick a background colour from the colour wheel, or use a hexadecimal colour reference. 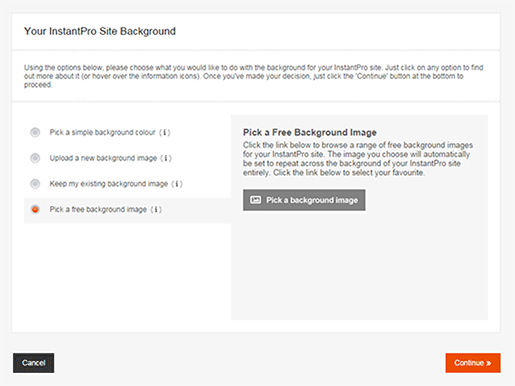 If you have an image which you wish to display as your site background instead of just a colour, you can upload your background image by selecting this option from the screen and clicking the Browse Computer button to select the image you wish to upload. This is the option which will be used for the tutorial. Once you have uploaded your image, you will see the screen as shown below, where you are able to set some advanced features relating to your web site background such as Repeating the Image, Alignment Options and advanced Colour Options. 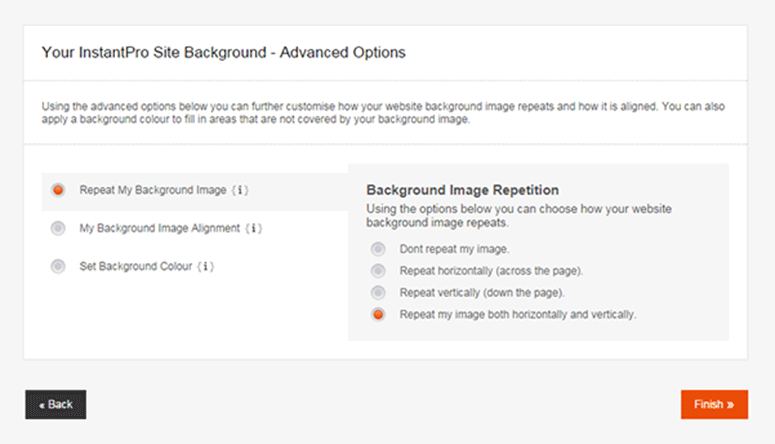 The first advanced option is whether you wish to repeat your image across the background of your site. The background image which has been uploaded is shown below. As you can see, it is a very small image and were this the background image on a web site, the background would look very plain indeed. This is where the image repeat facility is very useful. You will see there are options to not repeat the image, to repeat the image vertically, horizontally, or even both. For the example site, the image will be repeated both vertically, and horizontally. It is then necessary to set the Image Alignment. This option allows you to set the first point the image appears on the page. The option set is left (horizontally), and top (vertically). This means that the background image will be placed in the top left corner of the page and will then be repeated from there. If, for example, you have a background image you would like to only appear at the bottom of your page, you would select Bottom for the vertical alignment, along with the horizontal alignment of your choice. 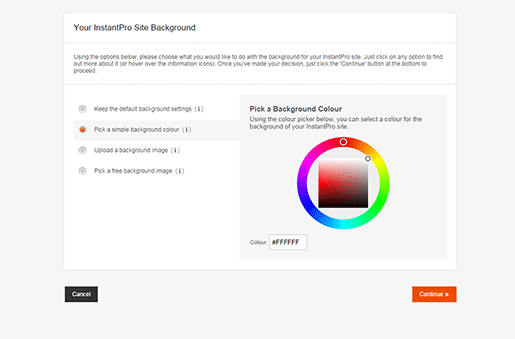 If your background image will not take up all the page, you are also able to set a Background Colour in addition to your own background image, which is useful if you would like to merge your background image with a nice background colour. 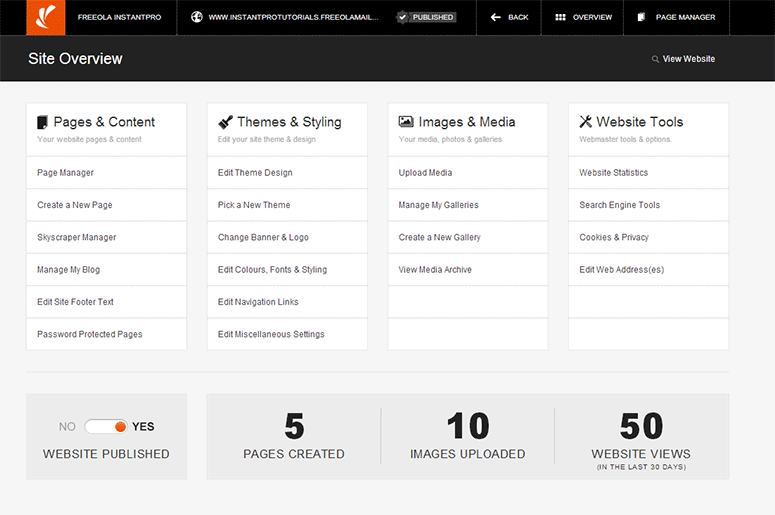 Once you have set everything on this page, you can click Finish to return to the web site design editor to view your site background. 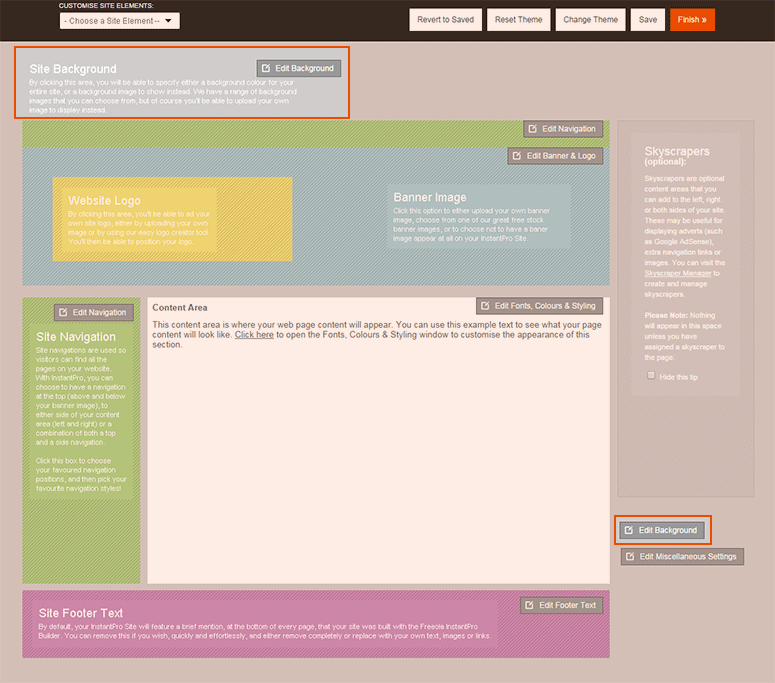 Below you can see the background image we have uploaded in this section of the tutorial, and also how it has been repeated across the page. 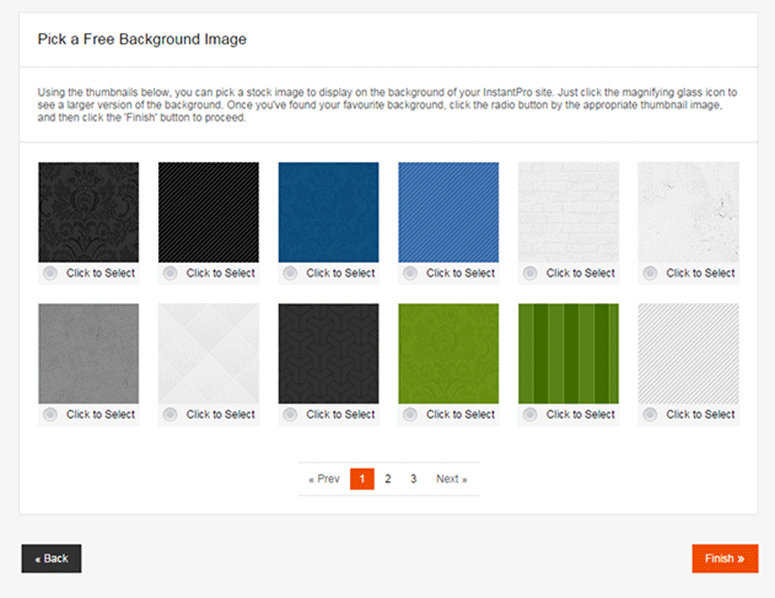 InstantPro also has a selection of free to use background images which you are able to use for your website. 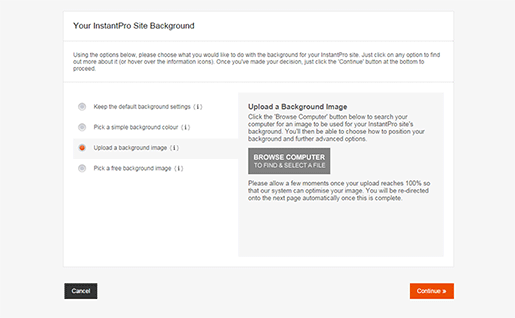 You will need to click the Pick a Background Image button shown on this page, and you will then be able to pick from a selection of free background images. Some of which are shown below. Once you have made your selection you will be returned to the web site design editor to continue styling your site.